Taking advantage of the great weather last week. I had to look for a shadow, because it was to warm to sketch in the sun. Unfortunately the rainy weekend has reminded me of the weather to come. I'm going to miss the summer. Hello Eva. Thanks for your comment and for the link to the portuguese USK. I like your drawings too. 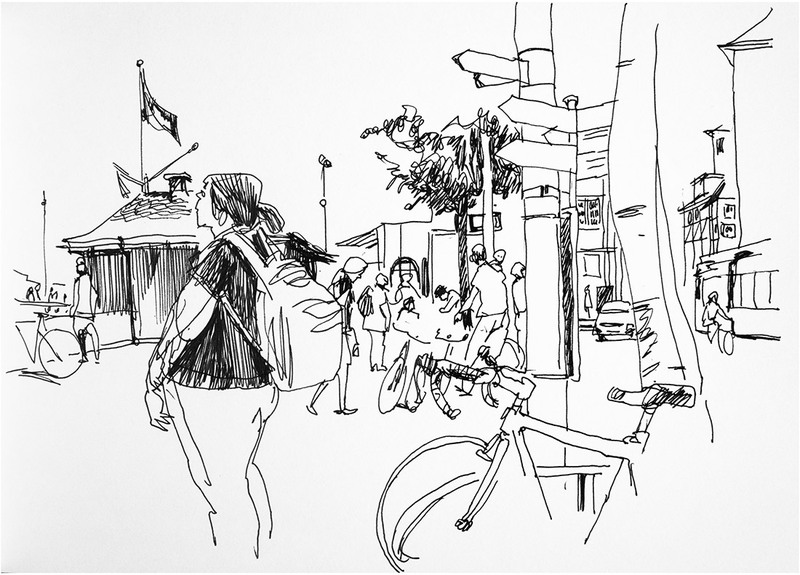 It seems most german urban sketchers are in the north, so if you ever want to join a swiss sketchcrawl you are of course welcome. I would be very glad!!! So hope to join in October next perhaps in Fribourg or when becames possible for many new drawings and new seeings!Thank you very much! And wishes of many sketches! I feel like I know this spot very well, as I've sketched here myself. Just a few of your lines captures it very well.